UPDATE: Washington State dropped its WNIT opening round road matchup 90-78 to the University of Montana at Dahlberg Arena Wednesday, March 19. The Cougars season ended with a 17-17 overall record, the most wins under head coach June Daugherty and the most since the 1994-95 team also won 17. The Cougars earned their first trip to the postseason since 1991. It’s more than 3,000 miles from the Galdeira home in Waimea to Washington State, sophomore guard Lia Galdeira’s new home in Pullman, Washington. Thanks to Pac-12 Networks, parents Kunia and Momi Galdeira don’t have to travel all that way to see their daughter play basketball. The Galdeira parents saw their daughter play in person for the first time March 8-9 at the Pac-12 Women’s Basketball Tournament in Seattle, but they follow the Cougs’ women’s basketball team very closely. 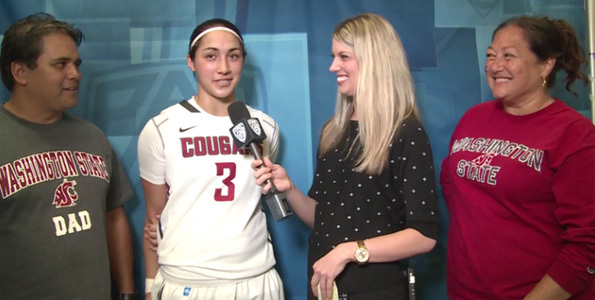 Saturday night’s Washington State-Oregon State Pac-12 Tournament semifinal on Pac-12 Networks was the 14th Cougars women’s basketball game to air on national television this season, delivering the most television coverage to the program in school history. Washington State sophomore guards Lia Galdeira and Dawnyelle Awa attended the same high school in Hawaii and grew up an hour away from one another. The dynamic duo has made quite the impact on the Cougs’ program, and vice versa. Over the last two years, the Cougars have become “hanai” – part of the Galdeira family. Awa and Galdeira were local celebrities in high school, and Pac-12 Networks has helped maintain their star-status in Hawaii. “Where we’re from, there’s a big buzz about WSU. Lia and Dawnyelle have been playing together since high school and it’s exciting to see them at this level,” Kunia said.